"The allegation, Mr Goldsmith, is that you bought forty-five gallons of ale for the six electors of the rotten borough of Dunwich to buy their votes, but only declared the cost of forty pints ..."
"Look, this is quite normal; in the event on the day they could only drink less than a firkin of 'Old Scrotum' between them before they all fell over, and with a wastage allowance for the lees, and tappage this is all well within accepted practice ..."
"... and furthermore you bought thirty-six new leather flagons embellished with the legend 'Zac bought me' ..."
"... again, you're twisting things. These flagons are the permanent property of the local party association, and it's likely they'll be used again for the Parish elections and the beating of the bounds and next year's witch duckings; we declared the cost of scribing the legend into the six of them we loaned to the local electors ..."
"You'd never actually been to Dunwich before election day, had you Mr Goldsmith? The seat was given to you by Mr Pitt because he thought you'd suitably embellish the Treasury benches, wasn't it?" "You're a fine one to talk about patronage, Mr Snow - you've just had your own son installed as Astrologer Royal despite the fact he can't even write his own name in joined-up script ..."
One of the most significant problems associated with outsourcing is that too often the contracts are drafted by the chums of the firms set to benefit, rather than by the recipients of the outsourced service. Thus hospital cleaning contracts drafted by PWC and KPMG are tendered for by Crapita and Crapco, producing a bonanza of fees and earnings all round but leaving the wards filthy and patients dying from buildings and staff rotten with pathogens. A few years ago a school governor friend asked me to look at a Standard Model Contract for cleaning their primary school. The budgets had been devolved, but quite rightly the school had to demonstrate that its procurement of services was competitive. The school was then cleaned by two sisters, both of whom had kids there, and a friend of theirs. They were being asked to complete a contract folio two inches thick, and submit a boxful of supporting information including their training policy, equalities policies, quality systems and a host of minor requirements. They would be bidding against two nationally known facilities management companies. The answer of course was to draft a replacement service specification that reflected exactly what was done and what the Head wanted to be done by the school's cleaners. This included providing replacement clothing for 'accidents' and laundering and returning the soiled items, acting as set dressers and stage managers for the nativity play and most importantly taking the school's goldfish and Syrian Hamsters home for the school holidays. The bulk of the onerous supporting information, so easy for large firms to churn out but a real market barrier for micro-enterprises, was to be provided only on winning the contract. The result was that the big boys declined to tender and the school kept its cleaners. If Cameron's empowerment means anything it's this. It's allowing Ward Sisters to dictate service standards and specifications, not some KPMG blow-in in Regional HQ. It's allowing park users to determine their priorities, not the strategic planning authority. And it's allowing me and my neighbours to set, and pay for, the services we want, not some bloke in a silk suit in PWC Towers. The Grauniad expects a tsunami of profits for the private providers from the cuts. I think they're being pessimistic. I think this could be a real chance for users to take control of the services they consume, discard the central Statist model that the big players are so inextricably entwined with and let's see how Crapita and Crapco respond to 20,000 micro contracts each with an empowered client holding the budget. We know what you are. The only question is how much? Sleaze, corruption and fat cat shenanigans in the piggeries of Newham this morning. It seems the 'abrasive' Joe Duckworth, the council's chief executive, returned from hols on Monday to a formal meeting with the council leader and lawyers. Following which he announced he was resigning to spend more time with his temper. Fair dos, you might think. We don't know how many legal actions are pending against Newham over Duckworth's behaviour, or what the council's liability from his 'abrasive' management style might be. For any other member of staff, you'd think a quiet resignation in such conditions was a good deal, but not for council chief executives. For some unimaginable reason, there is talk that Duckworth will have to be given a massive payoff; there is an almost Masonic agreement that these most cosseted of fat cats should have their mouths filled with gold every time they move. I've got a tip for any Newham resident reading this. Write to the council's Chief Financial Officer informing them that you believe that any payment in excess of a contractual minimum would be ultra vires and should properly be recharged to councillors if made, and that you are writing to the District Auditor in the same terms. London councils have a poisonous legacy of grossly overpaid fat cat bosses as a result of decades of PWC, KPMG, Crapita and the like peddling their specious snake-oil strategies to gullible councillors. It's time for a cull, and a cull at nil extra cost to the taxpayer. So pay Duckworth his last month's salary and take his mobile phone and door key from him on his way out. And do not engage some high-flown HR firm to find a replacement; they'll only lie that it needs a salary of £300k, then give it to a chief exec Masonic member from a neighbouring council. It's time to get real. "Hi! I'm from the BBC and my name is Caroline Thompson. Sorry to disturb you, but I've popped over to Loamshire Road today to pick up my taxi costs." "My taxi costs. For the last three months. Split between the 23 houses in your road, it comes to £145.50 each. Cash is good, but I've got a thing to take cards with, if you'd prefer"
"You spent £3,400 of our money on taxis? In three months?" "I assure you it represents good value - I can make work phone calls from the taxi, you know." "Um, taxi. He's waiting over there. He's a real sweetie - I've still got sixteen houses to visit"
"You've squandered my entire annual licence fee on your cab fares for one single working day?" "Oh yes! It's what we do!" One of the minor joys of my job is to direct clients' dosh towards the purchase of British goods whenever I can. Designers share with some cohorts of American society a belief that 'imported' means better. It's as untrue of architectural fixings as it is of liquor, and barely a week goes by when I don't append the magic words 'Or equal approved' to an architect's very precise specification of Swedish hinges or Italian toilet-roll holders, knowing a contractor will submit the Thwaite & Higginbotham equivalent given half a chance. My red pen notes - "No, lead times too long", "What is the relevant BS/EN standard for this?" or "Avoid - xchange rate risk" have the same effect. It's a small thing, but satisfying. The reality that both the 'imported' and British versions are likely to have been manufactured in Shanghai doesn't faze me. 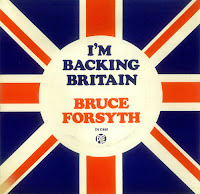 The last 'Backing Britain' campaign was way back in 1968; Bruce Forsyth even released a single, which sold nearly, er, 8,000 copies. There were Minis. And peach-faced English girls in wide belts and short skirts. 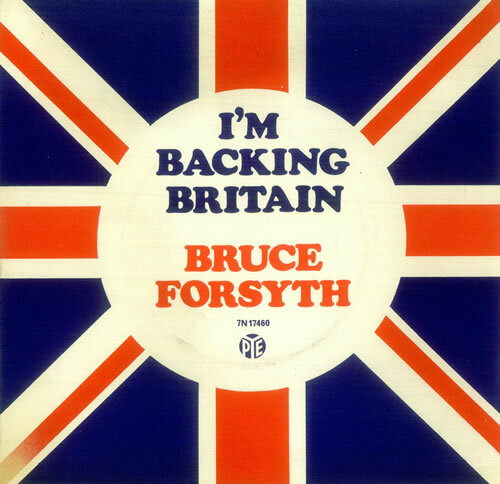 People sent cheques to the Treasury to help pay off the National Debt, and the Postmaster General introduced a union flag letter frank with 'I'm Backing Britain' on the nation's mail. The Trades Union Congress condemned the whole thing. The firm that started the whole thing off, in 1967, was Colt Ventilation and Heating Ltd. I'm pleased to say they're still around today, and helpfully providing on their website standard specification clauses for designers. I had one such yesterday; my pen hovered briefly before moving on, without leaving the magic words 'Or equal approved'. Women from the Mahgreb, from Somalia, Bangladesh and Pakistan who come to the UK are at severe and real risk of Vitamin D deficiency and all the consequent ill-health unless they spend decent periods of time outdoors with their skin exposed to sunlight. Light, English Summer clothes are the thing - with lots of bare arms and legs. We should therefore ban the Niqab immediately on health grounds, for the good of the wearers and the health and well being of society. Time to privatise unemployment insurance? The rate of unemployment when the nation is at full employment level is often debated; estimates range up to 5%, with a cluster of estimates around the 3% mark. This so-termed Frictional Unemployment recognises that at any time people will genuinely be between jobs for anywhere between a few days and a few months. The vacancy is there, the worker is there, but it takes a little time for the two to meet. Our system of unemployment benefit used to recognise that a different kind of support was needed for this short-term joblessness. A higher basic rate of benefit was paid dependent on the applicant's NI contribution record - if you spent more time in work than out of it you probably qualified - and on top of this an earnings-related supplement, based on recent previous income, damped the shock of temporary adjustment. This higher-rate provision lasted, I think, for six months before benefits reduced to the long-term one size fits all never-worked rate. And it was not means-tested - which meant in many cases that the combination of benefit, redundancy payment and savings allowed workers to move between jobs without having to endure the horrors of penury. As the long-term benefit rates became more generous and millions of citizens found a life on the dole to be a rational economic choice, this special treatment for those genuinely between jobs was abolished to pay the bigger bills. This not only places a grossly unfair burden upon those involuntarily unemployed with a high probability of finding work within a few weeks or months but acts as a disincentive for firms to shed staff and hinders a full transition from the 'job for life' culture to one of flexible labour markets. We should therefore think about splitting the unemployment benefits system. The private insurance sector, or mutuals and friendly societies, could easily provide a system similar to the old unemployment benefit system for those opting-out of a proportion of NI contributions. This would cover maybe somewhere between a fifth and a third of the jobless at any one time. For the rest - those who have never worked, those voluntarily unemployed and the small proportion of those who whilst not disabled are so lacking in physical or mental ability so as to make them virtually unemployable (council parks departments used to employ such people in some numbers, tasks such as collecting litter and leaves and sweeping being within their capacities) - Welfare needs to be ultra-local, with means-tested benefits administered and paid almost at the neighbourhood, parish or ward level, overseen by a panel of local citizens. The choice of an anonymous 'entitlement' from the State must end. The closer the relationship of the wallets and purses of taxpayers and the pockets of tax recipients the better. Jobs will be found for unemployed school and college leavers. The indolent, once in the local spotlight, will find that idleness is not a comfortable lifestyle choice, and perhaps we will even find local suitable employment for those with limited abilities. Above all, local transparency and the community's will to get all their number into work will extend the dignity of work, the benefits of 'belonging' and social self-respect to those who now endure the painful slavery of Welfare dependence. It's got to be a better way. It is a measure of Brown's dissociation from reality at the end that he seriously imagined the nation's process of political succession could be manipulated to spare him further humiliation. Politics is by its nature red in tooth and claw, unsparing of the feelings of the defeated, absent of the niceties of cosseting bruised egos. This morning you're Prime Minister, privy to the secrets of the Realm, but by this afternoon you're wrapping your framed photos for the removal man and phoning to find an overnight room in a Travelodge on the M1. The public has run out of patience, and so have I. I have served the country as best I can. I know the country’s mood. They will not tolerate me waiting another night. I have no option. You are a good man and you have to make a decision. I have made mine. It is final. I am going to the palace. Goodbye. But humiliated enough? Oh no. Not for his poisonous legacy. Not for the spoilation of our economy, or for the trashing of our national culture, the condemnation of two generations to Welfare slavery, for shredding our international standing and the destruction of our hallowed institutions. For all this, humiliation must haunt Brown to the grave. You'd have thought that one of the most discredited driving forces behind Labour's disastrous term in office, the Managerialism cult, would have gone into hiding by now. A vast pyramid of pointless bureaucracy that earned billions in fees for Crapita, KPMG and the rest of the City leeches who somehow managed to convince Labour that what the public sector really wanted was many thousands of performance indicators and every manager an MBA. But not a bit of it. You can bet your last dollar that the corporate directors of the big five are now schmoozing all those newly appointed Tory ministers in an effort to keep the milch-cow in production and their six figure salary and bonus packages intact. Oh, and keeping the grass roots alive by continuing to peddle the specious myth of Performance Management in the public sector. The argument goes like this. You need to set an interlocking pyramid of performance objectives as part of an annual review process for every individual in the organisation; the individual's objectives are therefore those of the organisation. To reinforce this, you need a system of rewards and disbenefits. Since you can't without great difficulty change the salary and contracts of millions of public sector staff to make pay partially dependent on performance, you need to pay a bonus on top of their contractual salary as a reward and, er, only pay most of it as a disbenefit if they fail to meet their targets. Of course, this private sector model is almost wholly artificial when translated into the public sector; without any relationship to a P&L account or balance sheet, the 'targets' become ever more ingenious and ever more meaningless. What meaningful annual performance target can you invent for a town planner? For a building control inspector? For a fireman? Or for a police officer, come to that? For much of the success of the public sector is determined not by outputs but by outcomes. A low rate of crime is an outcome, an individual plod's arrest rate is an output. The latter does not necessarily lead to the former. Reforming public services will involve reshaping the front line. Management is the key to a new era of greater productivity. A culture of poor performance management presents a barrier to those effective managers who do want to bring about change. What is needed is to transform the structure of our public services to support these leaders and to change the behaviour of the rest of the public service workforce. The key problems with current performance management structures and the changes needed to improve them will be discussed. The shindig was sponsored by, er, the ICA, Crapita, PA Consulting and Sodexo. You'd need a heart of stone not to weep.